Stems: Erect, slender, widely spreading, wiry-branched, appressed-bristly hairy. Leaves: Alternate, stalked, triangular in outline, 2-3 times pinnately divided; leaflets ovate to linear-lanceolate, .25 to 2.5 inch long, to .75 inch wide, short hairy; margins toothed or regularly divided; tips pointed. Inflorescences: Umbels, compound, loose, open, 1/2 to 2 inches wide, on slender stalks 1 to 5 inches long, terminal and lateral; primary and secondary umbels with 3-9 rays 1/2 to 1 inch long. 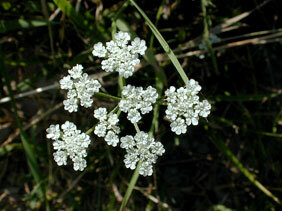 Flowers: Tiny, white; calyx teeth present or absent; petals 5, outer petals usually with 2 lobes. Fruits: Egg-shaped, less than 1/5 inch long, ribbed, densely covered with microscopic hooked bristles. Habitat: Waste areas, edges of woods, and low shady places. Origin: Hedge parsely is an introduced species that is native to the Mediterranean and is now naturalized in the U.S. Comments: Hedge parsley can be an aggressive weed. The fruits cling to clothing and fur.